I have never read Ovid; I am not an older single woman; and I have never lived in a Condo on Miami Beach, and yet I was totally able to relate to J, our narrator, who is trying assess in her later years, whether it's time to give up on love. There is a wonderful humanity in this slim semi-autobiographical novel and quite a few laughs, too. Who doesn't need a few laughs right now? 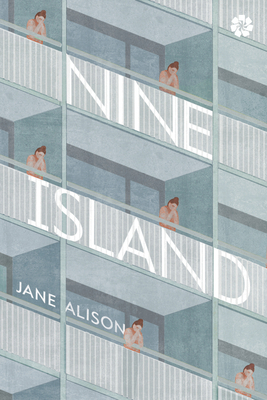 Nine Island is an intimate autobiographical novel, told by J, a woman who lives in a glass tower on one of Miami Beach's lush Venetian Islands. After decades of disaster with men, she is trying to decide whether to withdraw forever from romantic love. Having just returned to Miami from a monthlong reunion with an old flame, "Sir Gold," and a visit to her fragile mother, J begins translating Ovid's magical stories about the transformations caused by Eros. "A woman who wants, a man who wants nothing. These two have stalked the world for thousands of years," she thinks. When not ruminating over her sexual past and current fantasies, in the company of only her aging cat, J observes the comic, sometimes steamy goings-on among her faded-glamour condo neighbors. One of them, a caring nurse, befriends her, eventually offering the opinion that "if you retire from love . . . then you retire from life." Jane Alison is the author of a memoir, The Sisters Antipodes, and three novels--The Love-Artist, The Marriage of the Sea, and Natives and Exotics--and the translator of Ovid's stories of sexual transformation, Change Me. She is Professor and Director of Creative Writing at the University of Virginia, and lives in Charlottesville. Learn more at janealison.com.